Example after example can be found, from the time of the Greeks and Ro­mans, who had coins showing the goddess Minerva holding a round shield, to 10-12th century ivory carvings of so called barbarians with the shield, and modern archaeological digs that find surviving Viking round shields with its center boss and handle, and into the 16oo’s with the Scottish Targe. This round shield was the one I was most interested in, not a shield that was held by a cen­ter handle but had an armband and grip. The form of the Highland Target is round, usually from 19 to 21 inches diameter. It is constructed of two layers of some light wood, often of fir, the grain of the one layer crossing that of the other angu­larly, and the pieces dowelled together. Over the wood, a covering of leather is lightly stretched for the front of the target, and a piece of hide, often of calf-skin, with a stuff­ing for the back. A handle, sometimes of leather or iron and an arm-strap were fixed at the back, near the opposite sides of the circumference of the target. Occasionally there were two arm-straps and some­times instead of arm-straps, a sleeve of leather was fastened to the back of the target. A boss of brass usually occupies the centre of the front of the target. The boss was occasionally pierced for a spike which screwed into a socket at the base of the boss. When not in use the spike was carried in a sheath at the back of the target. The use of the target in Scotland was not confined to the Highlands. The statutory equipment appointed by the Act of 1425, for such yeomen or burgesses as were not archers, was “sword and buckler, and a good axe or broggit staff;” and in 1481 the axemen who had neither spear nor bow were required to provide themselves with targes “of tree “or leather, according to patterns which were sent to each of the sheriffs. The watchers of the burgh of Peebles, in 1569, were armed with jack and spear, sword and buckler. 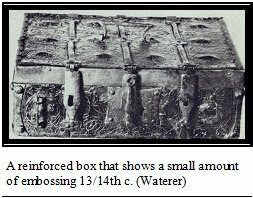 It is a hard item to document, the dis-arming act that took place af­ter the Battle of Culledon in 1746 had the targes stripped of its leather and the wooden core was made, “ to serve as the covers to their butter-milk barrels”. 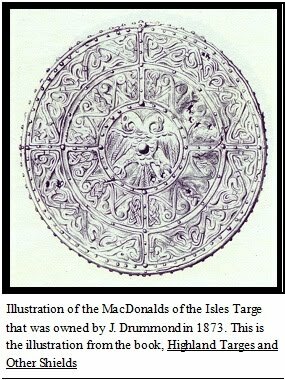 (2) From a reprint of a book written in 1873 by James Drummond called Highland Targets and Other Shields, I was able to find illustra­tions that were in the in the National Museum of Antiquaries in Scotland, the one that I was interested in was an illustration of the MacDonald of the Isle Targe. 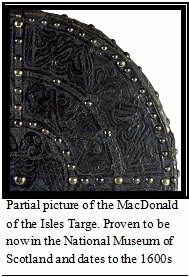 I was able to confirm that the Targe in now in the National Museum of Scotland and dates to the 1600’s, also through correspondence with the museum I was able to get a picture of the targe proving that the illustration from Drummond was very accurate. This project is my interpretation of a Scottish Targe and took several years to complete. It was always intended to represent a ceremonial piece, something to be considered an art piece by whoever saw it. The wooden core of this project is 3/4’’ birch, cabinet-grade plywood, cut with a ban-saw and a circle cutter, that was made to work with the saw. The use of the ply-wood is the modern equivalent to planks being layered cross-grained then pegged together for strength. The leather used for this project was all various weights of vegetable tanned leather. 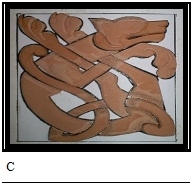 This leather was chosen because it can be molded, shaped, incised and tooled allowing the design to stay after the work has been allowed to dry. 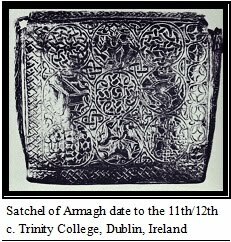 From Anderson’s discription, “but more frequently, the surface of the leather covering is tooled with a variety of patterns, disposed in symmetrical spaces”, I am able to understand that a vegetable tanned/cured piece of leather was used in the making of targes. Also leather of this type has been used in period to make a variety of items from throughout history. 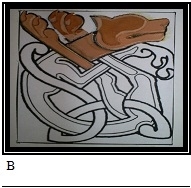 I am able to document the use of celtic knot work on leather through John W. Waterer’s book, Leather Craftmanship. This book has a section on Irish book satchels or budgets. 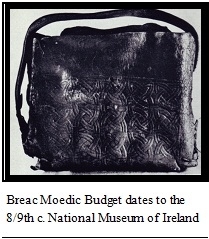 Two of the examples are still in existence, one is the Breac Moedic Budget that is in the National Museum of Ireland, Dublin and dates to the 8th or 9th century and the other is the Satchel of Armagh which is now at Trinity College, Dublin and dates to 11th or 12th century. 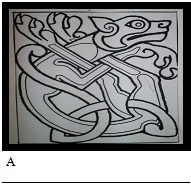 The front of the Targe has the four types of Celtic design represented: a spiral design covers the middle center like a ‘boss’ would; zoomorphics, in four sections, in a design of intertwining hounds and herons forms the inner circle; knotwork, in four sections, forms the outer ring and keywork or maze-work incorporated into the leather tabs that wrap around the outside edge. 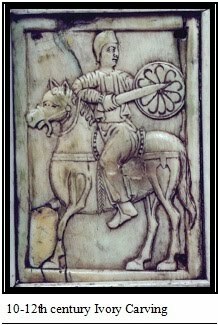 Historical references (3) were always a starting place for the designs but I felt that I should work up my own designs in order to have the ‘fit’ I wanted for the various elements needed for the front of the targe. 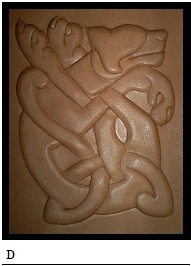 I used leather working tools to make the spiral impressions that are in the back-ground of the knotwork and the rounded impressions that are in the background of the zoomorphics. The use of the tools helped in securing the glued leather to the wooden core. Stamp im­pressed leather items have been found dating from the 1400’s and before, there are several examples in Goubitz’ Purses in Pieces. able to buy what I wanted through a company called Restoration Hardware, the nails looked hand wrought (wrought= beaten or formed by hammer blows) and I was actually looking for two sizes of nail heads for this project and was able to find both at this company. pony hide us­ing leather strips to hold down the edges. on the front of the targe. of leather. The join is under the handle and was cov­ered by sewing another piece of leather over the top of it. The decoration is simple keywork, I felt that with such a highly decorated project I didn’t want the handle to be plain. Again this piece was nailed to the wooden core using the nails that had been used on the front. The only cut work or incising was done on the key work designs on the edge tabs and the ends of the armband. All other work was either the plug work or impression work in which the design is not cut before the tooling was done, especially on the armband. Cut work is not as common in period pieces as impression work but has been documented by Olaf Goubitz in his book, Purses in Pieces. The glue, dyes, paints and antiques that were used on this project are all modern and were used long before considering this project acceptable for an A&S project, I do think that I would have decided to use them anyway because the acrylics of today are much safer and much less toxic than some of the pigments used in history. I am interested in working with period dyes and finishes but at this time the right project has yet to be found. I am extremely happy that this project as finally come to a completion, the time spent on it was well used in learning new techniques and solving problems concerning construction. With this challenge behind me, it is time to find another one! Varberg, Jeanette. “Rare Viking-era shield found in Denmark” The Kings Fortresses.